Recently we were able to catch up with Jonathan Collura of Bugeaters FC after his return from England, to see why his new club in Lincoln, Nebraska is such a mover and a shaker at the fourth level of US Soccer. 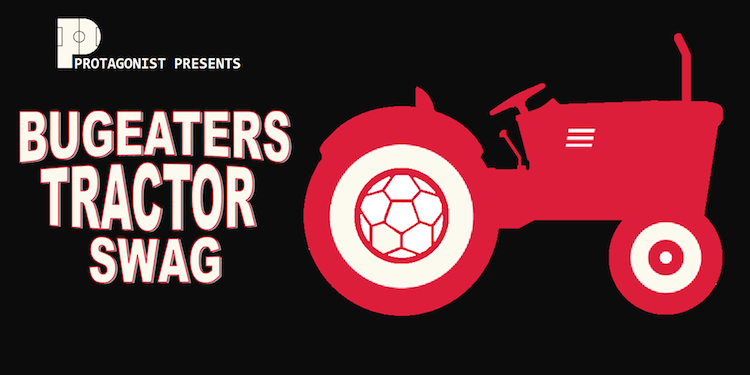 From a world-recognized and appreciated badge to a catchy but regionally specific nickname, Bugeaters FC branding is hitting on all of its tractor’s cylinders. Don’t forget to click the “Tractor Swag” link at the bottom of this week’s Spotlight for a chance to win an awesome Bugeaters FC practice kit! The club was technically founded about twelve months ago. I had been looking at placing a team in Nebraska since about 2014 and finally in 2017, I decided that if I didn’t do it, I didn’t think anyone would. USL has been looking at Omaha a while and I think that level will do well in the state. I have always been interested in the development side of the game in the US. Nebraska has some fantastic collegiate programs and I felt that we could fill the gap of being an extended season. Outside of college, the state has some excellent youth programs (although we have no connections to them). Going forward, we expect to be actively involved in the community and helping multiple youth programs within the state. Bugeaters focus is on community involvement with the club and the development of local talent. We look forward to expansion within the state with a USL program at some point and will still fit the development side of the game. What were the motivations behind the badge, mascot and colors? Are there any connections to, or inspirations drawn from other clubs in the world? I wanted to nod to Nebraska’s long history in agriculture. The tractor on the badge is actually based on one that my grandfather had. The name as you know is a nickname of native Nebraskans at the end of the 19th Century. Black and white I have felt always looks clean; the combination is based on my high school (Omaha Westside). I felt that having the ball on the badge was needed to show the game that we play (as the only team at this level in the state). What are the goals of the organization? does that include an ambition to grow quickly or more just see how it goes? We have looked to build and take a step to the next level, but the politics of the game in the US have held us back. So, we have decided to continue building on the success that we have had in 2018 and just be us. I’m actively involved in the game in England and I enjoy the structure and how each club has its’ place. The management of the leagues is handled in line with the FA and the politics and fees don’t come into play. You actually get paid to be in a league because the leagues split income with the clubs (unlike in the US). Right now, the immediate goal is to find a place to play in 2019. The challenges we have faced since the end of the season have been surprising to us. The team is brand new, but are there any players who've made an instant impact? Anybody notable who's come from another league or club? The squad last season was excellent. Aaron Champenoy did an outstanding job of getting the wheels in motion and coach Mark Heath-Preston assembled a top-notch team. I’m hopeful that many of them return next season. The club was represented on many collegiate teams in Nebraska this fall and we expect this to continue. It’s difficult to single out the guys because they all in my opinion made an impact. Each one of them added something to the team. If we could keep the squad intact next season, I would expect big things. I expect some of them to go on to the next level. It’s tough to say given that we had just one season. I do believe a rivalry can be healthy if managed. Ones that I can see potentially developing that we played last season would include Des Moines Menace, Kaw Valley, Quinto Elemento and possibly St. Louis Maritsa. We choose to focus on the community. Are we helping to develop a connection with the youth? What are we doing to help advance the game in the state of Nebraska? What can we do to make a positive impact on the fans? That’s what this team is about. As noted, the politics of the game have been an obstacle and we expect them to continue to be. We know that we can’t change that but we can make a change locally. Is there anything important to you which we missed? I have been involved in the English game since 2014. Right now, I am with Bradford (Park Avenue) AFC in the National League North (6th division and 2nd step of non-league). I think it would surprise many that the playing budget at this level is as much as some USL clubs (based on reports that I have seen). The quality of play is outstanding and the English system no doubt has helped them develop at a national level. I’m hopeful that the US will begin listening to some of the entrepreneurs involved at the club level and the leagues will look at clubs instead of expansion fees. The game is definitely being held back in the US because of it. We need to unify in one system and focus on each club fitting in somehow. At the US non-league level, we have too much competition and too many leagues looking to keep going based on a buy-in model. We aim to be just us. No one can take that away. If we have 1 fan in the stands we will continue to play and focus on filling that development gap in Nebraska.